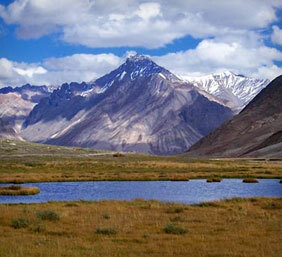 Rangdum is a small town which is sparsely populated and situated betweenpadum and Kargil. The landscape is spectacular due to the surrounding hills ,pastures, streams and glaciers.Is an excellent site for trekking base-camps.Rangdum Gompa is another major spot to visit. 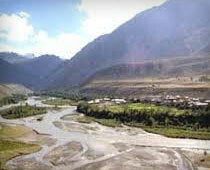 Panikhar is one of the most scenic site of Suru valley.it lies at the border of the valley and is renowed for a ruined fort constructed by Zorawar Singh,when Zorawar Singh intended to conquer Tibet. Sankoo is a picturesque town surrounded by few villages and vibrant rocky mountains. There is a dense plantation of poplar,willow and wild rosrs in this bowl-shaped valley,giving it a feeling of nam-made forest. It is also a famous picnic spot. Trespone village, spectacular and sprawling,is worth visiting.It has a quaint mixture of Islamic and Tibetan elements in construction style.It's a place where trading of making a prototype of s ancient Scythan bow is still carried out by some families. Dara-Drung Glacier has speechless beauty.The glacier begins to make appearancewith thcool chill in the wind owing to its large ice-reserve. It is lacated at an elevation of 3500m and in indeed a feast to the eyes.